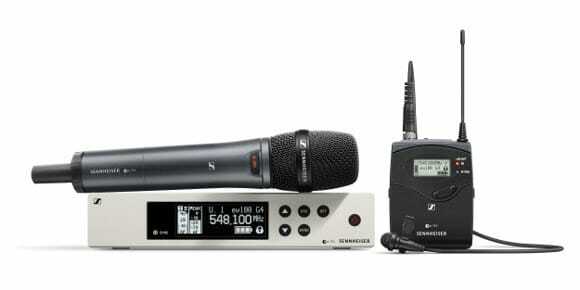 Thursday, January 25, 2018 — Anaheim, CA – Sennheiser evolution wireless users have come to expect an ever-evolving feature set with each new microphone generation, and evolution wireless G4 is no exception: With a sleek new user interface, a generously expanded switching bandwidth and higher RF output power for the 300 and 500 series, new multi-channel functionality for the 100 series and brand-new on-camera systems, G4 delivers high-quality, reliable audio for musical performances, houses of worship, theatres, business and education settings as well as camera work. Launched at NAMM, the series will be available from April 2018. Bands, houses of worship and community theatres will find their ideal wireless solutions within the 100 G4 and 500 G4 series. The 100 series comprises Vocal Sets that include the acclaimed capsules of the evolution e 835, e 845, e 865, e 935, and e 945 microphones. Also available are an Instrument Set, a Headmic Set and two Lavalier Sets with either the ME 2-II (omni) or ME 4 (cardioid). All transmitters and the receiver are also available separately.